Hi friends! I wanted to let you know that this will be my last post for the week, as I really want to unplug and enjoy time with family... you know, Babycakes...Dear Hubby...my inlaws. 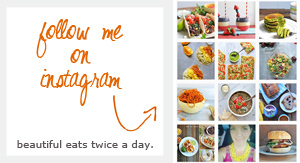 And I'm sure you will be spending more time focusing on your own families and food and just being together rather than reading blogs or looking for new recipes :) I found this saying/photo on Pinterest -----> and just love it! Bless the food before us, the family (and friends) beside us, and the love between us. Whenever I FINALLY find a new house to live in, this will be going up in the dining room! I just want to take a quick moment to thank you for being wonderful readers, commenters, and partners with me on this journey towards the happy healthy life. 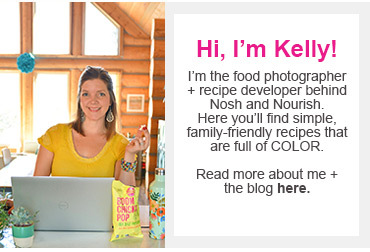 You really have enriched my life over the past 8 months (this blog won't be turning "ONE" until February!). I look forward to the future and all that we will experience together! Have a wonderful and blessed Thanksgiving. 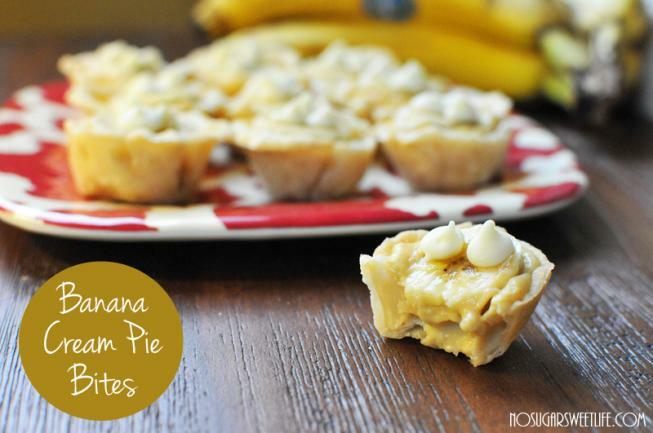 These banana cream pie bites give the white chocolate pumpkin pie ones a run for their money. I think I might actually prefer the banana ones!! They are decadently delicious. They look fancy, but are so easy to make! There's only 1 Tbsp of agave nectar (or honey) for sweetener, as the bananas and greek yogurt and Nilla wafers are so sweet already. The best part? These amazing little four bite "Banana Cream Pie Bites" are only 84 calories each. So enjoy 2 or 3 of them without any guilt!! Calores = 84; Fat = 1.2; Carbs = 11.2; Sugar= 3.9; Protein = 0.85; Fiber = 0.19; WW Points = 2. Looking for other healthy dessert alternatives? Divide each pie crust into 12 small circles. Press them into each hole of the muffin tin. Brush egg white onto the crusts. 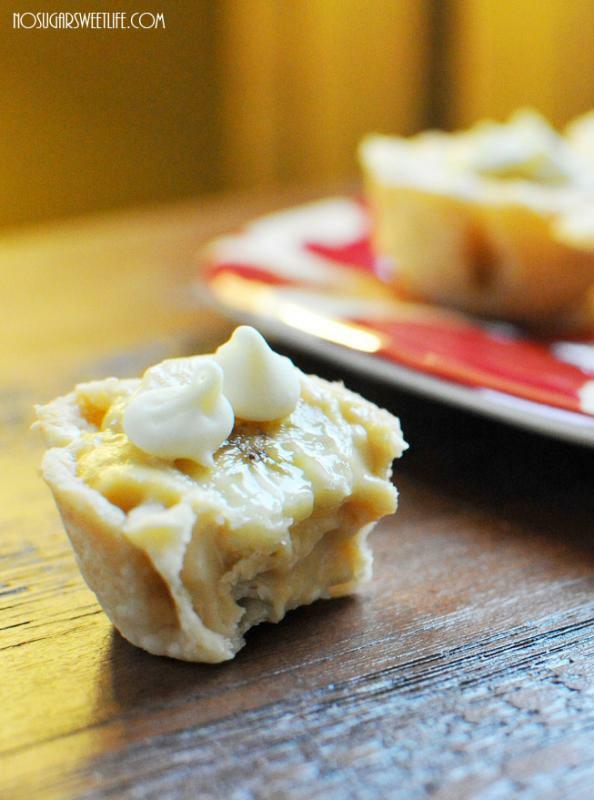 Bake pie crusts in mini-muffin tin for 10 minutes. Meanwhile, mix together in a large sauce pan: the greek yogurt, the banana squash puree, almond milk, agave nectar, yolks, nilla wafers, and vanilla extract. Cook over medium heat for approximately 8 minutes, stirring frequently to prevent it from burning. Once filling has thickened, let it cool for about 10 minutes. Slice the one and a half bananas into 36 thin slices. Place one banana slice at the bottom of each pre-cooked pie bite crust. Spoon the banana cream filling on top of the banana slice. Top each pie bite with 3 white chocolate chips, or a dollop of whipped cream, whichever your preference. Let the pie bites cool for at least 2 hours in the fridge before serving.